The unspeakability [of the name of God in the Jewish tradition] has long been recognized, but we now know it goes even deeper: formally the word was not spoken at all, but breathed! Many are convinced that its correct pronunciation is an attempt to replicate and imitate the very sound of inhalation and exhalation. The one thing we do every moment of our lives is therefore to speak the name of God. This makes it our first and our last word as we enter and leave the world. It is hard to express how profoundly this observation from Richard Rohr has struck me. For a long time, I had been aware of the Jewish tradition of not pronouncing the name of God [Yahweh]. Most Jewish people, when encountering this name in the Bible, will substitute the word adonai, which we translate into English as Lord. In most English translations of the Hebrew Bible, the word LORD (in all capital letters) is written where, in the Hebrew text, the name of Yahweh appears. The origin of this tradition of not pronouncing the name of God is debated. It may have to do with the ancient idea that to know someone’s name was to know something of the essence of the one named, and since God’s essence is unknowable, the name should not be pronounced. The tradition may have arisen from the practice of not writing out the name of God for fear that it might be later erased or defaced in some way. Or, it may be a matter of respect or reverence. Richard Rohr’s observation points to an opinion held by some scholars regarding how the name would have been pronounced in ancient Hebrew, and indeed, if you match the pronunciation of the name to your breathing, it is easy to see why some scholars have arrived at this conclusion: it simply works! And, it points us beyond the traditions regarding the use of this name to something more profound. To appreciate that our every breath cycle is an invocation of the name of God is to appreciate the universality of the sacred. Those of us who make a home in a particular religious tradition are often tempted to come to the conclusion that our particular religion gives an exclusive access to God that no other tradition can provide. Yet to recognize that every human being in every moment of life on this earth is breathing the name of God is to recognize that God is universally present and universally accessible. No one has a monopoly on breathing: each of us needs it to live. 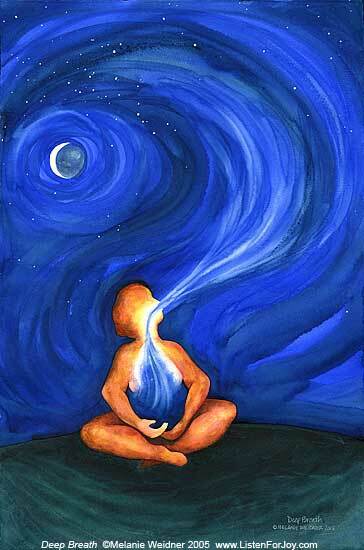 Perhaps this is why, in Hebrew, the word for “breath” and the word for “spirit” is the same word. One of the creation stories in the book of Genesis speaks of Adam (whose name represents all humanity, rather than a particular historical person) coming to life at the moment God puts breath into him (which, in the Hebrew of Genesis, is the same thing as putting Spirit into him). It is quite likely that the author of John’s Gospel had this in mind when he told a story about the Risen Christ appearing to his disciples and giving them the gift of the Spirit by breathing on them (a sign of the new life which has become available to them through Christ). Breath, God, Spirit — these are all intimately connected in the Jewish and Christian traditions, and they point us toward a God who is actively connected to the whole of the human family. From this point of view, we might begin to see the Judeo-Christian tradition not in terms of exclusivity, but rather as a unique path that uncovers what is universal in human experience: our connection to the sacred. To recognize that every breath we take is an invocation of God also helps us to recognize that a kind of centering prayer is available to us at all times. All we need to do is take a moment to be conscious of our breathing, to focus on inhaling and exhaling in a mindful way, and we can experience an immediate connection to God as the One who is within us (as signified by our breathing) and all around us (as signified by the air we breathe, and the wind which is the air moving around us). No words, no prayer books, no beads, nor any other aid to prayer is needed: our breath and our breathing is all we need to experience ourselves as grounded in God.